Marcus Sureshot is helping his fellow villagers to gather wood for the winter. Wonderful job! The steam has a very nice look to it. Though I must say I'm not the biggest fan of that path, it's just too straight in my opinion. All in all, an outstanding build. Nice work! I do agree, the path needs work. Thanks for the C&C. I have been wanting to do a medieval woodcutter moc for sometime. This is great! I like your saw. Good detail. 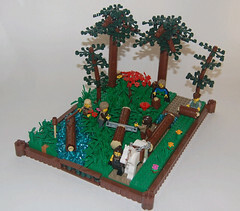 Fraslund wrote: I have been wanting to do a medieval woodcutter moc for sometime. This is great! I've also been juggling an idea like that around for a bit. You did a nice job on the posing the minifigs and the trees.